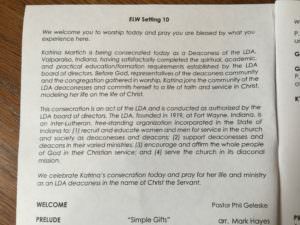 I was not very familiar with the LDA (Lutheran Diaconal Association – thelda.org) until I met with Katrina Martich a few months ago. 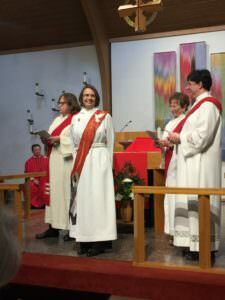 Katrina is a member of St. Matthew Lutheran Church in Fort Worth, and now a newly consecrated Deaconess in the LDA. 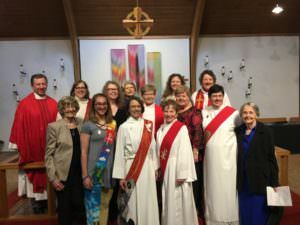 The LDA is not connected to our ELCA roster but does work to educate, train, and prepare deaconesses and deacons for a life of Service. 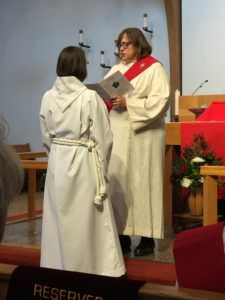 They include Lutherans from all branches who share a common heart for serving. 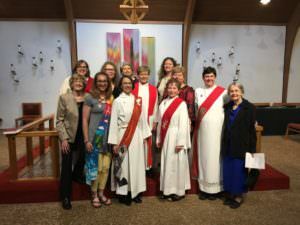 Today was the day Katrina was consecrated and her service was well attended by Deaconesses from around Texas but also several other states. This is a tight knit group of dedicated servants who love and support each other. 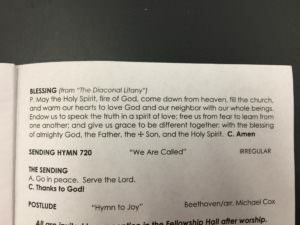 This commitment to service was reflected in the whole worship service from hymns to lessons and prayers as well as the final benediction. It was a beautiful day of service.